Due to technical issues, both of my Let’s Plays are currently on hold, possibly for as long as another two weeks. But I still have a few videos uploaded to Youtube from before my recording computer fell to pieces, and this is the latest of these. I think this is the first time I’ve discussed the Enneagram in a video. Seriously, I’ll turn up the microphone gain or the volume or whatever the next time I do one of these, I swear. Super amateur, that’s me. One of my favorite things about this episode (and the rest of the game) is the character of Lee. 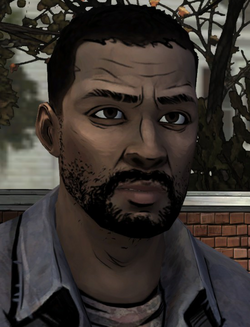 Lee Everett: Survivor. Badass. History Teacher. I probably mentioned my appreciation for Lee back when I started the Let’s Play, but I want to put my thumb on his greatness (?). I love subversive tropes and character archetypes. So it can’t be surprising that I find Lee appealing — in a field of storytelling that is so often dominated by young, meat-headed, musclebound white dudes with a penchant for kickboxing and gun-slinging (or any other art of violence), here comes Lee Everett, a black 37-year-old who’s completely out of his depth in the zombie apocalypse. He’s not a fighter — he’s a history professor. He’s kind of like Indiana Jones, except for all the badass parts. He has killed someone before — but not in a war or a conflict, not even in self-defense. He murdered a guy in cold blood, driven by a selfish twist of passion. A lot of videogames start the player character off in a prison (or otherwise incarcerated) for a crime they never committed. In fact, most of those games offer a plot line where the hero gets to clear their name and punish the true criminal. In The Walking Dead, there’s never any doubt that Lee really did it. His guilt and regret is evident every time the subject’s brought up, and depending on the player’s actions, Lee can try to forget the crime (because there are more pressing matters to attend to, like all the zombies) or own up to it (because it was still murder, and he needs to atone). By the end of the game Lee exchanges a few of these traits for more commonplace ones — his marksmanship and melee skills level-up considerably, and his guilt for his past eventually dies off when weirder, more immediate problems arise — but that’s character development for you. Competency increases and flaws recede, leaving a better, stronger person. For this first episode, though, Lee is one of a kind. In fact, if I were to narrow down the list of game protagonists to the heroes with a set gender and personality (Lara Croft, Nathan Drake and Master Chief, for instance) then Lee might just be my all-time favorite player character. Because he’s That Guy — the right person at the right time, forced to make do with a bad situation. That wraps it up, I think. Thanks for reading (and watching) and I’ll see you later.